Oh, hey there, first generation Toyota MR2! It's always a delight when you randomly see one of your favorite cars on the street. These may not be extremely rare, but they're not exactly common as Corollas either. I noticed this dark blue MR2 in a neighborhood not far from where I live in southeast D.C. The funny thing about the first MR2 is that pictures don't do its size justice at all — it's remarkably small in person, and I'm always reminded of that when I see one. It makes for a ridiculously fun driving experience, and it's probably easy to parallel park, which is a good thing in this town. 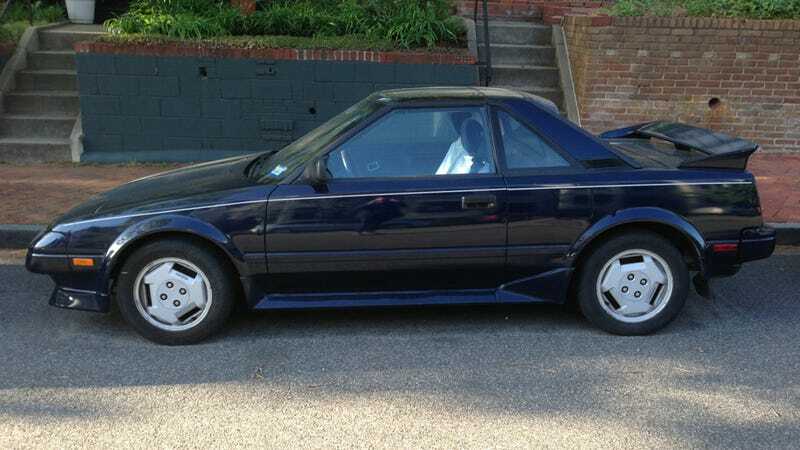 This first-gen MR2 is the one that ran from 1984 to 1989. Powered by Toyota's famed 4A-GE engine, the car may not have had astronomical horsepower numbers, but it was a blast to drive, especially in the rare barnstorming supercharged trim. The MR2 line had kind of interesting evolution. After this it became a larger, vaguely Ferrari-looking, much more powerful turbocharged coupe, and in the late 90s it morphed again into a convertible-only Miata fighter that offered excellent handling but never really took off with enthusiasts like its predecessors did. In terms of performance, I'd take a second-gen turbo MR2. But I love the looks and character of the original. It's a tiny, unapologetically small and impractical sports car, and it's 1980s as all hell. Look at those angles! Look at those pop-up headlamps! The whole package is so sharp you could shave with it. The one I found seemed to be in respectable shape considering its age. I assume the seats are kind of torn up, hence the sheets covering them up. Other than that, besides a few dings and scratches outside, it looked okay overall. Hopefully it still runs well too. I love that there was a time when Toyota was willing to produce a small, affordable mid-engine sports car. That's a genre you really don't see all that much anymore, which is kind of a shame. The masses deserve mid-engine performance too! It shouldn't just be for millionaires who can afford exotics. The Boxster fills that niche in a way, but it's not exactly cheap either. As always, Super Jalopnik Bonus Points for whoever can guess which year this one is. I looked on the window sticker and I think it said '86 or '87, but I don't remember offhand. Does anyone have any MR2 stories to share? And would you like to see this make a comeback?